The air conditioner can be used to set a comfortable interior temperature in the vehicle. The air conditioner provides heating and ventilation and also cools and dehumidifies the air inside the vehicle. The air conditioner is fully automatic and will maintain the desired temperature at a constant level. To achieve this, the temperature of the air supplied to the interior, the blower speed (volume of air delivery) and the air distribution are regulated automatically. The system also allows for the effect of strong sunlight, so there is no need for manual adjustment. For these reasons it is advisable to use the automatic mode for the comfort of all the passengers in virtually all conditions throughout the year. The humidity of the air is automatically reduced when the system cools the interior of the vehicle. This helps to prevent condensation on the windows. If the humidity and temperature outside the vehicle are high, condensation can drip off the evaporator in the air cooling system and form a pool underneath the vehicle. This is normal and does not indicate a leak. If the outside temperature is low, the blower normally only switches to a higher speed once the coolant has warmed up sufficiently (this does not apply to the defrost setting). In order to achieve maximum engine power, the air conditioner compressor is temporarily switched off when pulling away from a standstill with full throttle. The compressor also switches off if the coolant temperature is excessively high, to ensure adequate engine cooling under extreme loads. The pollution filter (a particle filter) serves as a barrier against impurities in the outside air, including dust and pollen, and odours. The air is also filtered when the air recirculation mode is activated. For the air conditioner to work with maximum efficiency, the pollution filter element must be replaced at the intervals specified in the Service Schedule. If the vehicle is driven in areas with a high level of air pollution and the filter is no longer fully effective, it may be necessary to change the filter element more frequently. The currently selected air conditioner settings are automatically stored and assigned to the remote control key. To prevent the battery from becoming discharged and to maintain the necessary power level, the system will temporarily shut off the electrical components that are using a lot of power, or reduce the current they are consuming. Heating systems in particular use a large amount of electrical power. If you notice, for instance, that the rear window heater is not working, it may have been temporarily switched off by the power management function, or regulated to a lower heat output. These systems will be available again as soon as sufficient electrical power is available. For safety reasons it is important that all the windows are kept free of ice, snow and condensation. These can cause poor visibility and lead to an accident. Please familiarise yourself with the operating controls for the air conditioner, including the demist/defrost functions for the windows. • If you suspect that the air conditioner is damaged, switch it off to prevent further damage and have the system checked by a qualified workshop. 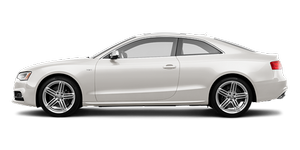 • Repairs to the Audi air conditioner require specialist knowledge and special tools. For this reason, please contact a qualified workshop if the system is not working properly. • Keep the air intake slots in front of the windscreen clear of snow, ice and leaves to ensure unimpaired heating and cooling, and to prevent the windows misting over. • The air from the outlets flows through the passenger compartment and out through the slots at the rear of the vehicle. Do not cover these slots with clothing or other objects. • The air conditioner operates most effectively with the windows and the tilting panorama roof closed. However, if the vehicle has heated up after standing in the sun for some time, the air inside can be cooled more quickly by opening the windows for a short time.